StageBuzz.com: FRIGID Festival Interview - Heather Cohn of "The Stranger to Kindness"
FRIGID Festival Interview - Heather Cohn of "The Stranger to Kindness"
Heather Cohn is a co-founder of Flux Theatre Ensemble and currently serves as the Producing Director. Directing credits for Flux include Erin Browne’s "Menders," August Schulenburg’s "The Lesser Seductions of History" (nominated for Best Director, New York Innovative Theatre Awards) and "Other Bodies" (FringeNYC Excellence Award for Outstanding Direction); staged readings of Jose Rivera’s "Sueño" and Adam Szymkowicz’s "Pretty Theft," August Schulenburg’s "Channeling" and Bekah Brunstetter’s "Miss Lilly Gets Boned." Outside of Flux, Heather recently directed David Stallings’ "The Stranger to Kindness" (Outstanding Overall Production of a One-Act, Planet Connections Theatre Festivity Awards, also nominated for Outstanding Direction award). Heather has also directed for the EstroGenius Festival, On the Square Productions, Epic Theatre Ensemble, Artistic New Directions, and Crossroads Theatre Project. Member – Women’s Project Producers’ LAB (2008-2010). By day, Heather is the Director of Development for Epic Theatre Ensemble. She is a graduate of Vassar College. Show: "The Stranger to Kindness"
I’ve been involved with theatre as far back as I can remember. The first play I have a strong memory of attending as a kid was a production of "Anne of Green Gables." I used to put on plays in our living room as a kid with my sister and my friend Alix, with our parents and neighbors serving as the audience. Then in middle school I discovered stage crew, where I got to paint and hang out with all the “cool” guys, which led naturally into my time as a stage manager and set designer in high school and into college. It wasn’t until after college that I really shifted my focus to directing. My husband, August (“Gus”) Schulenburg, and my theatre company, Flux Theatre Ensemble. The two are intimately linked, as Gus is also the Artistic Director of Flux and a fellow co-founder of the company. I don’t think I would be a director today if it weren’t for Gus and Flux, and for that I am deeply grateful. Flux is my creative home – a place for me to take risks, learn and explore with artists I trust and admire through long-term collaboration. And Gus, who is a playwright, has taught me so much about how to work with new plays and new playwrights through a development process into production. 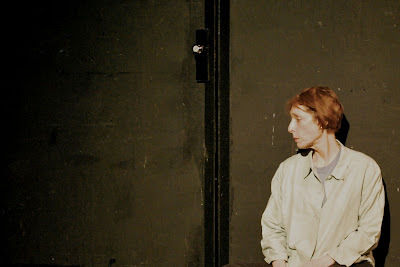 "The Stranger to Kindness" is a heartbreaking one-act about a senior woman whose friend has stopped answering her door. The entire play takes place in the hallway outside the friend’s apartment. It struggles with big questions, including: how we treat senior citizens in our society; what are the responsibilities of being a parent, a son or daughter; how do we grapple with fear and hope; and what does it mean to be a true friend. What inspired me to direct the play the first time is what is continuing to inspire me as we rehearse it again for this new Festival and venue: its rich and layered subtly and the incredible journey these characters go on in just a short 50 minutes. It’s a true testament to David’s talent as a writer and the beautiful work of the actors that this play continues to surprise me at each rehearsal. And I can’t wait for more people to see it and be as surprised and moved by it as I am. I had the great fortune to work with most of this creative team on the first production of "The Stranger to Kindness" in the Planet Connections Festivities this past June 2011. The playwright, David Stallings, and producer/actor Antonio Miniño, approached me about directing after seeing my work on "Blood" at the 2010 Estrogenius Festival (in which Antonio performed in another piece). We had a wonderful initial meeting about a different play of David’s, but then for various reasons, we landed on this piece, "The Stranger to Kindness." Susan G. Bob, our amazing lead, came to us through a recommendation of a friend, and I’m thrilled to be working with her again on this second production. This is my first time working with actor Mick Hilgers, and I must say we’re having a blast. Our lighting designer, Carl Faber, and I actually go back the furthest — we went to Vassar together years ago. I am directing Flux’s next production - "Deinde" by August Schulenburg at The Secret Theatre in Queens (April-May). This show will kick off Flux’s 5th Anniversary Season, and is being presented in association with the BFG Collective, a group of three Indie theatre companies (Boomerang, Flux, Gideon) in residence at The Secret Theatre through June. About "Deinde" - In the not-too-distant future, the pressure to cure a global pandemic spurs the creation of Deinde, a device that allows a team of brilliant quantum biologists to think directly into a powerful computer. At first, they use this prosthetic for the mind under strict rules of engagement, but soon noble ideals and personal passions lead a few to break the rules. They discover that Deinde’s power is far greater than anyone first imagined, and their world spins out of control, raising questions of morality, consciousness, and what it means to be human in an age of rapid technological change. Please sit toward the front! This is a beautifully intimate play, and I don’t want audiences to get lost in the back of the house at the Kraine.